Stacey Burdick according to The St. Petersburg Evening Independent. He earned that honor while pitching his Pinellas County team to the 1985 National Baseball Congress national tournament at Wichita, according to The Evening Independent. "A lot of batters were looking for the fastball, and the slider looks like a fastball until it drops off at the last second," Burdick told The Evening Independent. "Mostly, that's how I got people out in Tampa." Burdick went on to turn pro in 1986, signed by the Orioles as an undrafted free agent. But, while he worked to get people out for six professional seasons, he never got the chance to do so in the majors. Burdick signed with the Orioles out of Hillsborough Community College and Pinellas High School in Florida. With the Orioles, Burdick started at rookie Bluefield, going 4-3 in 12 starts there, with a 6.75 ERA. Burdick returned to Bluefield for 1987, also getting time at single-A Miami and Hagerstown. He played at Hagerstown all of 1988, getting 22 starts there and going 10-10, with a 3.64 ERA. He remained in single-A for 1989, playing at Frederick, but it was a brief season, just nine outings. In Burdick's first start that year, he went five innings, giving up three hits and picking up the win. Burdick first made AA in 1990, his fifth season. In 20 outings, 16 starts, he went 8-9, with a 3.93 ERA. In one stretch that year against Albany-Colonie, Burdick went 14.1 innings, without giving up a run. 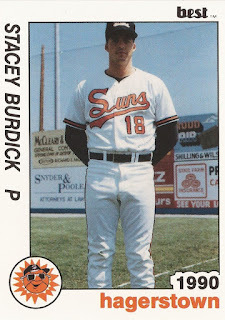 Back at Hagerstown in 1991, Burdick picked up 26 outings, 21 starts. He also went 11-4, with a 2.99 ERA. In June, he went seven innings in one outing, giving up just four hits. But it was Burdick's final season as a pro, his career ending after six seasons.